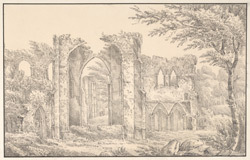 East view of Furness Abbey in Cumbria. An abbey was founded here in 1123 for the Savignac Order, which in 1147 was absorbed by the Cistercians. It was located at the foot of a once remote valley and was surrounded by deep forests. Despite its isolation, it was a wealthy and powerful abbey until its dissolution in 1537. The ruins show the 12th and 13th century abbey was remarkably undisturbed. Late 18th century visitors were impressed with its picturesque situation and the 'venerable grandeur of its Gothic arches'. The 1882 Mannex's Directory of Furness and Cartmel quotes Thomas West's 'The Antiquities of Furness' as saying, 'the character of this deserted ruin is scrupulously preserved in the surrounding area; no spade has dared to level the inequalities which fallen fragments have occasioned in the ground, or shears to clip the wild fern'.